A good board fence should last about 20 years if you use oak boards and well treated posts. During those 20 years the fence needs to be repainted about once every 3 years or less. Anything over 3 years and the wear and tear on the fence will be noticeable, but it also depends on how many horses you have in the field and how hard they are on the fence. Oak boards are the best boards to use for livestock since they will resist a horse that cribs much longer than either pine or poplar. Oak is a hardwood where as poplar and pine are softwood and they will not last and not put up to the rigors of animals and weather as well as oak. If you do use pine or poplar boards then you want to get them treated, this will allow them to last as long as oak only if the animals do not wear them out. The longevity of board fence can also be affected by they type of post that you use. Of course all fence need to have a well treated 6 inch faced or round post. A 6 inch post provides a lot more durability as they can withstand more punishment and weather than 5 inch post. The downside to faced post especially when used in conjunction with a Baton or face board is that the boards will rot out quicker. By rot out quicker I mean maybe a few years difference in the life of your fence. I have taken down fence with a baton on it that was 20 years old and you could tell that it was rotting but the fence was still fairly stout. If you are lax about the painting and upkeep of your fence then it will rot the board that much quicker. Round posts are probably the most used type of post since they are the cheapest and easiest to get. Since the board has less contact with a round post it will get more paint coverage, and will not rot as fast. But the same thing that keeps the board from rotting out quicker also gives you a weaker fence. As boards dry out they will shrink this will cause a gap to appear in between the boards where they meet on the front of the post. If you have a round post that already does not have much surface to nail to and then the board shrinks it will give a much weaker fence than with a faced post. Say for example you have livestock running on both sides of a fence. A round post will be very weak against the animals on the back side of the fence. They wont have to try hard at all to push the boards off. If you want a more practical example take a hammer and try to knock a board off from the back side of the fence. Then try from the front side. You will see the difference for yourself. No matter which post you use you should have a baton on your wood fence. A baton will do 3 things for a fence. Make it stronger, stop the boards from warping and make it much better looking. A baton does hide the shrinking boards, so you will not see the gaps in them. The baton goes on the face of the post and will hide and actually help stop the boards from shrinking as much. Batons also increase the strength of your fence by linking all the boards together. If you have livestock on both sides of a board fence then you really should have a baton on it. Another good thing about boards is that you don’t have to do anything extra for the curves. With all other fence you have to brace or concrete the post in the ground but with boards all you have to do is drive the post and hang the boards. And since curves really make a fence look a lot better and make it safer this above any other reason makes boards a good choice. 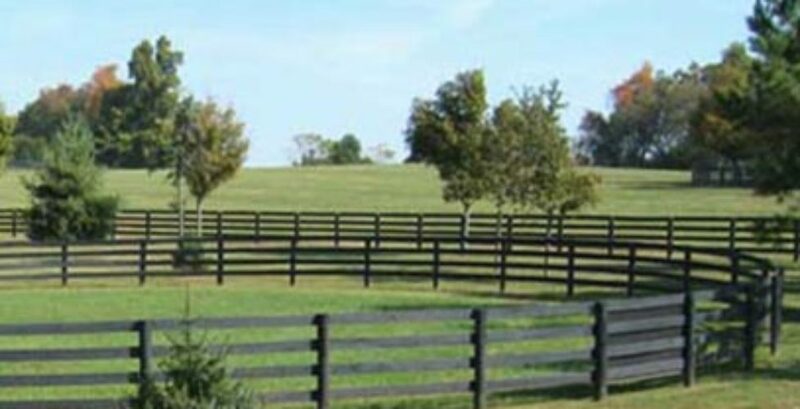 Board fence when its painted regularly and repaired on a needed basis is a really attractive fence and can complete a farms look.